The current leader of the US-appointed Iraqi Governing Council, Jalal Talabani, says Iran has agreed to help it fight terrorism in Iraq. Mr Talabani was speaking to the BBC after talks in Tehran - the first overseas visit by an IGC delegation. 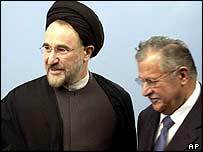 He said the Iranians had accepted that the current wave of attacks in Iraq was not resistance to occupation but the work of indiscriminate killers. The Americans have often accused Tehran of exercising a hostile influence. The high-ranking delegation is next heading for talks with government and business leaders in Turkey. Iran signed agreements to work with the Iraq Council on a number of issues, while offering assurances that it would not meddle in Iraqi affairs. Iraq's interim Foreign Minister, Hoshyar Zebari, said Iran had agreed to help tighten control along the long border between the two countries and try to prevent infiltration. Ministers from the two sides have also signed memoranda of understanding which would involve Iran in many areas of the reconstruction effort in Iraq. They have also agreed in principle to an oil export arrangement under which Iraqi crude would be treated at Iran's Abadan refinery, while Iraq would be given Iranian oil to sell from terminals further down the Gulf. The BBC's Jim Muir in Tehran says the Iraqis were clearly delighted by the reception they were given and the co-operation promised. But the visit to Turkey is set against a background of years of distrust between Mr Talabani and Ankara. Mr Talabani has made several visits to Ankara as an Iraqi Kurdish leader, but this is his first visit in his new role. He has already successfully opposed US plans to have Turkish troops join the multi-national force in Iraq. He says that what Iraq need is Turkish businessmen, Turkish money and Turkish support for the country's new structure. The BBC's Steve Bryant in Ankara says that in order to win Turkish confidence, Mr Talabani will have to convince a sceptical Ankara that Iraq's Kurds do not seek autonomy in a federal Iraq. He will also be pushed to crack down on Kurdish rebels based inside northern Iraq. Turkey has been fighting the rebels since the 1980s and used to accuse Mr Talabani of being soft on them. Iraq's US-appointed IGC has pledged to establish stable and friendly relations with all Iraq's neighbours. However, plans to include another neighbour in this trip, Syria, have been cancelled. Relations between Damascus and the new provisional leadership in Baghdad have been strained by what the Iraqis see as a disrespectful Syrian attitude. Both sides agreed that more preparation would be needed before such a visit could take place.